Also referred to as Football Stockmarket, Football Index is, in essence, a football stock market that opens a new dimension to the way trading is done. How? It enables its customers to buy and sell shares in football players (aka futures) with real money and make a profit out of it! All football fans that sign-up with the Football Index Referral Code MAXBET can expect a £500 risk-free welcome offer to kick-start this adventure. Visit the Football Index official website. Click on the green “Start Trending” tab on the top of the page (around the middle of the screen). Fill out the sign-up form with the information required. In Step 2 of the registration form, you are asked to provide the Football Index Referral Code if you have any. This field should be automatically filled with MAXBET. Hit “Finish” to confirm your registration. The next phase involves making a deposit of at least £10 and up to £500. You will have 7 days to figure out if Football Index is for you. If it is not, you can ask for a full refund of your deposit! Ensure that you read the full list of the terms and conditions of the sign-up offer, though, to know exactly what to expect. Consider this to be a stock market of some sort, where you, among other traders, are in search of football players with the best potential. You are also eager to purchase a good player at the lowest price possible. Then, if that player makes the cut and reaches his peak, you can sell him for a significant profit. The better a player you have bought performs, the more in demand he will be; hence, this value will increase. Another way to earn dividends through a player is by him topping the Football Index Buzz charts (Media Buzz or Performance Buzz). If he is among the most talked about footballers in the media, you also get your fair share of happiness in the form of extra cash. Those that have played Fantasy Football will notice several similarities with Football Index. The only difference is that instead of investing in an entire team that you believe will do well, you get to pick and make a profit off of individual players. There are several ways to get a good return on your investment. You could start with Youth Players that you speculate will perform well. These are usually sold quite cheaply, so you have lots of room for profit if it all goes well. Nevertheless, you can buy players that have already made it on the big stage, such as Ronaldo, Messi, Neymar, and more. If your player is in the media eye, you will be able to earn dividends. These are also called Peak Players, which, to you, means peak prices in the majority of cases. Now, share prices can increase if many traders buy shares in the same footballer or if a player is high in the Media or Performance Buzz charts. In detail, the Performance Buzz is a scoring system that highlights how many points your player can receive for excelling in different things. For example, you will win up to 18p per share if he plays well. Media Buzz, on the other hand, reflects your player’s value based on the media rumours and is calculated using a long list of reputed publications, including The Guardian, Huffington Post, Football League, The Times, Daily Mail, Telegraph, and Independent. A special algorithm embedded in Football Index UK determines how favourable an article is or not. The more positive the article, the more buzz points your player gets. At the end of the day, whoever has the most buzz points will earn the payout of the dividend. Another way to make a profit is via Football Index Trading, where you add a player, whose shares are still in little demand, to your portfolio and then sell him once his price rockets (when the demand will come for him). The goal when involved in Football Index? To build your portfolio of footballers via purchasing and selling players that will make you a strong profit. The best thing about Football Index? You don’t lose your full stake if you invest in a player because you can spread out the risk (there are several strategies to help you). That way, your portfolio will not be significantly affected if a player loses some value. Many experienced users prefer to put 2/3 of their bankroll on steady players that come with improved chances of topping the Media and Performance Buzz charts (no chance of them losing value, plus you get good dividends from them) while keeping the other 1/3 of their bankroll mainly for players whose value is low, at that given time (but they expect to increase shortly), and a smaller portion for youth players. So, the actual risk refers only to their youth players selections, which is a very low risk compared to the total value of their shares (but carries a great potential for huge payouts). 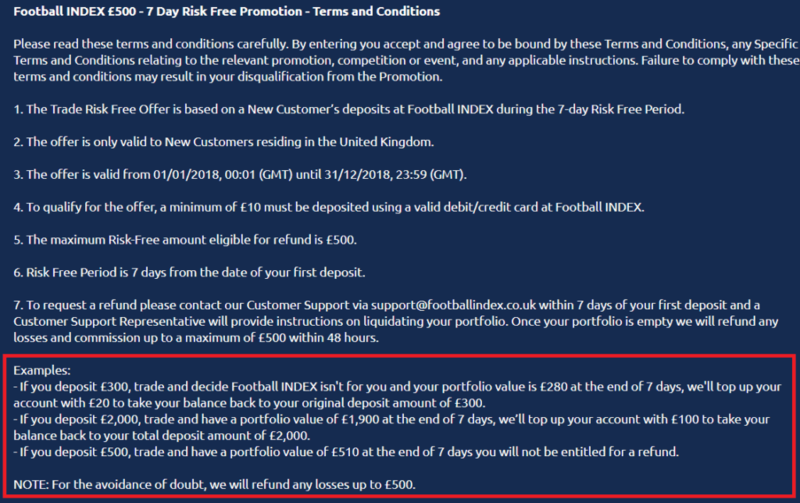 If within seven days from registering and using the Football Index referral code to get the £500 risk-free offer, you decide that you are not happy with your overall experience, you can request a refund. In this case, Football Index will top up your account with the sum missing so that you get your balance back to the original deposit amount unless your portfolio’s value after the 7-day period exceeds £500. Using a Football Index referral code to register with this football stock market is probably one of the more lucrative things a football fan with some knowledge of the sport could ever do. Considering the great sign-up offer that enables you to trade risk-free with £500 and the various ways to make a profit, you definitely have more to benefit from compared to other forms of trading and betting. And, if you decide that this endeavour did not live up to your expectations, you can ask for a refund and explore other alternatives; as simple as that!